We decided we had to go back up and visit, and have been checking out the surrounding areas and attractions. The Smokies is a huge attraction area. We live at the beach and it gets so hot down here. I love it in the mountains, especially the cool nighttime. We have decided on a few places to go and the HollyWood Wax Museum will be one of our destinations. The Hollywood Wax Museum is another we are dying to go see. Check out the link below and get tickets for when you go! However, if you want an all access pass, keep reading! Enormous fun awaits you below the Great Ape of Pigeon Forge! But the 40,000-pound primate isn’t the only star you’ll see at the world-famous Hollywood Wax Museum. In fact, you can pose with the biggest stars, while learning about their pets, pet peeves, and accomplishments. Movie buffs, pop culture lovers, and everyone who wants to step into the spotlight with the stars will enjoy the fun, and artistry. Plus, with the All Access Pass, you get to take a ride up into the mouth of Great Ape and see the spectacular Smoky Mountains from the VIP Observation Deck (weather permitting). Are you The Chosen One? In Hannah’s Maze of Mirrors, find your way through the mirrored corridors hidden inside the Castle of Savannah to save Princess Hannah. You’ll have to make your way through 288 potential turns among hundreds of mirrored walls and archways and several sections where you see infinite reflections in every direction. Join the battle against evil at Castle of Chaos, the world’s first 5D haunted attraction. Your mission: help the Paranormal Professor find out what supernatural activity is lurking inside. Soon you’ll find yourself in an all-out shooting adventure where the highest scorers appear on the screen. Finally, in Outbreak – Dread the Undead, you must stop a worldwide viral outbreak! Chemacorp might mean well with Alpha Strain, but the gene-altering substance turns humans into zombies. The challenge? Rid the world of Alpha Strain and prevent a total zombie apocalypse! Here is the deal, you can buy one admission to one spot. However, you get a better deal when you get an ALL Access Pass. The pass will allow you to get four attractions for one low price! That is a great deal, especially when traveling with a family. Please visit http://hollywoodwaxentertainment.com/ for more information. It is open 365 days of the year. Your Pidgeon Forge vacation will not be complete until you visit of these gems!! Visit The Hollywood Wax Museum And Castle Of Chaos! 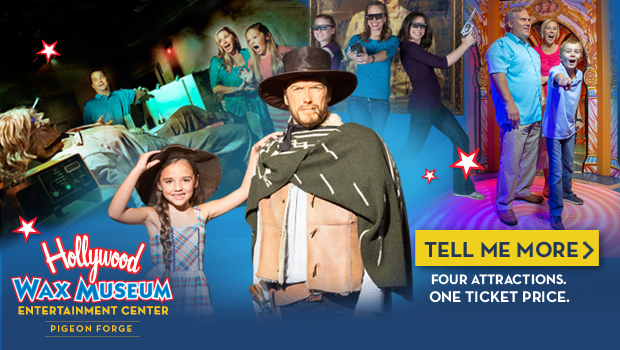 Score Big Savings at Hollywood Wax Museum NOW! Hollywood Wax Museum - Fun for Everyone! I have my FIRST OSCAR! Hollywood Wax Museum Pigeon Forge Fun with the Stars!